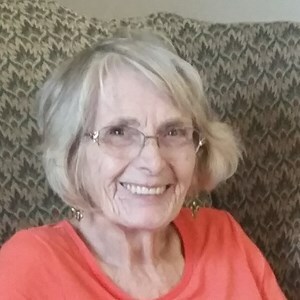 Joyce Ann Woods, 78, of Herington, KS passed away on December 26, 2018 at Legacy of Herington. It was her desire to be cremated. No services are scheduled at this time. She was born on December 28, 1939, Kansas City, KS to Charles and Mary (Sheehan) Ethridge. On March 19, 1960 she married William Bollinger in Miami, OK; they had three daughters. William preceded her in death on October 1, 2000. She later married John C. Woods in Fort Riley, KS; John also preceded her in death on July 3, 2006. Joyce is survived by her three daughters, Eadye L. Bollinger of Herington, KS, Carol L. Thierolf of Manhattan, KS, Gigi L. (Lonnie) Howard of Columbus, OH; two sisters, Leeann Ethridge Holloway of Kansas City, MO, Susan Ethridge Riffle of Omaha, NE; four grandchildren, Benton Thierolf of Manhattan, KS, Jessi Howard of Los Angeles, CA, Wesley Thierolf of Manhattan, KS, and Demi Bollinger of Herington, KS. She was preceded in death by her husbands; father, Charles Harold Ethridge; mother, Mary P. Ethridge; sister, Marilyn Sass; and niece, Lisa Sass-Stauch. Dove Cremation & Funeral Service of Junction City, Kansas is assisting with cremation arrangements. ***To leave a special message for the family, please click on the Share Memories button. Add your memories to the guest book of Joyce Woods. We here at Legacy of Herington will joyfully remember the time we shared with Joyce. I will be having a memorial at our facility for Joyce and others that have recently passed, at which we will share song and prayers. Our prayers go out to her family to hopefully give them strength. ~~ God bless.